Stringwise! is an annual large scale weekend playing workshop and concert especially designed for young string players. Stringwise helps to build confidence, speed up progress and provide young players with valuable orchestral experience. We cater to all ages and abilities, playing a great variety of music, from classics to pops. Stringwise! provides the opportunity to play a wide variety of music, take part in amazing concerts and in a range of orchestral groups and workshops, all in a relaxed and friendly atmosphere. Stringwise is an annual event which takes place in November. There are no auditions! 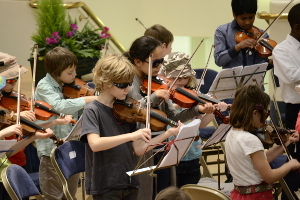 The children are carefully supervised and the orchestras are conducted by specialist leaders. Music and practise CD’s are sent in advance of the course. Did you see the 2016 BBC Young Musician of the Year competition? If so, then you will know that Nottingham cellist and Stringwise alumni Sheku Kanneh-Mason won this year with his exceptional cello playing. For Sheku, it all started back in 2005 when he saw his sister perform in our Stringwise concert and became transfixed with the cello section and decided that was the instrument for him! He then switched from violin to cello and went on to take part in our Stringwise courses, impressing our conductors with his astonishing ability to play everything from memory! Here he is aged 6 and aged 17, from the beginning to winner of the BBC Young Musician of the Year. Congratulations to Sheku! “I would just like to thank you for an amazing experience; for my daughter and the rest of our family. I turned up on the first rehearsal day with a very nervous 9 year old who knew no one. Your helpers immediately put her at ease and the way she was ‘processed’ was wonderful. At every stage there was a smiling face and a warm welcome, from entering the building to getting her settled in her place and her instrument tuned.